This week, passions ran high at the Encinitas City Council meeting. I prefer it when we get along and build on each others’ good ideas, but our philosophical differences are real. Strongly held feelings, including mine, can sometimes result in disharmony. I felt that this week and hope we return to calmer waters soon. Fiscal Discipline, Even for Law Enforcement: One of our most contentious issues right now involves our yearly $12.7 million law enforcement contract. It’s unfortunate that law enforcement has become a politicized issue, because the safety of our citizenry is every councilmember’s highest priority. The disagreement among us is about how to fulfill that commitment. My fundamental belief is that we are meeting our responsibilities for public safety, as evidenced by our low crime rate, and we spend a lot of money every year to ensure that result. We spend about half of our city’s yearly budget on police, fire and marine safety. Our $12.7 million sheriff’s contract currently supports 54 deputies, detectives and sergeants. I have seen no statistics that show increasing crime in Encinitas. Like all cities, we need to be able to adapt to emerging issues while also living within the budget. We have a new sheriff’s captain who just started last week. I believe it’s reasonable and fiscally responsible to ask him if he can prioritize the downtown and our beaches within his current budget. After hearing from the outgoing sheriff’s captain at this week’s meeting, Mayor Kristin Gaspar and Councilmember Mark Muir wanted to hire a new sheriff’s deputy on the spot for about $250,000 a year with benefits. I don’t believe outgoing managers should be making hiring and personnel requests. Let the new captain weigh in after he evaluates his department. I think we have to ask every department, even public safety, to live within its allotted budget. Whenever we expand the government payroll, those costs never go back down. The fact that we haven’t hired new deputies since 2004, in which time the population of our city has only grown from 60,000 to 62,000, isn’t enough justification for me. I also don’t want a solution that relies on expensive overtime. We voted 3-2 to ask the new captain to return with his own analysis. 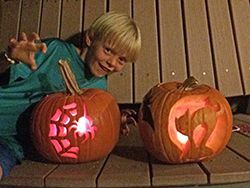 I hope everyone had a safe and fun Halloween. The Blakespear family sure did! These pumpkin carvings were the best yet from our household. Elimination of Glyphosate at City Parks: We’re steadily moving toward becoming a more environmentally friendly city, thanks to advocacy from those in the community and on the council who care about sustainability issues. This week, we voted to eliminate the use of glyphosate, which is the main weed-killing chemical in Roundup and is known to cause cancer. Crossing the Tracks at Montgomery: Change is coming to the Cardiff rail corridor in a few short years. The rail corridor, like the freeway, isn’t directly controlled by us, but by regional and state agencies. We provide input and some influence, but we can’t veto or approve projects such as the freeway widening or double-tracking the railroad. (The city also doesn’t fund these projects). In addition to double tracking through Cardiff over the next few years, we’ll see a reconstruction of the Chesterfield Ave. intersection, and a coastal rail trail – a bike and walking path — that connects Cardiff to Encinitas in the rail corridor. This rail trail will be on the east side of the railroad tracks where people live. 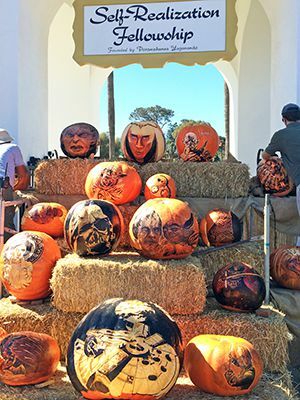 The Self-Realization Fellowship outdid themselves this year with their artistic home-grown pumpkin creations. In anticipation of this, the city is pursuing a pedestrian crossing at Montgomery Ave. to provide legal and safe beach access without people having to go to Chesterfield Ave. or Santa Fe Drive. This is an important and critical access point for surfers, dog walkers, families with strollers and everyone else who enjoys the beach. At this week’s meeting, we voted 3-2 (Shaffer, Kranz and me in favor) to award a $573,000 contract to develop the plans, construction documents, and environmental clearance, and to secure approval at the state level. It’s too bad that the entire city council wasn’t behind moving forward on this project, which is critically important for improving safe and legal beach access. Mayor Gaspar and Councilmember Muir opposed it based on what appeared to be concerns about noisy train horns and a desire to do more strategic planning. The consultant we hired will do public outreach as part of figuring out how to address the noise issue with either quiet zones or wayside horns. With the consultant on board, we can reasonably expect to put the crossing in at the same time as the rail trail, which wouldn’t be likely otherwise. Working through the bureacracy is challenging and complex, and it requires expertise for success. Also, the consultant’s contract can be terminated, so it’s a relatively low-risk investment for a very important beneficial result. High-priority projects need to move forward. We have to get started if we want this to happen. Budget Surplus: The city estimates conservatively in budgeting, and this week we were presented with great news that we have a $6.8 million budget surplus. We voted unanimously to put five percent of it, or $340,000, toward unfunded pension liability. When we return to strategic planning in December, we’ll discuss all of our city’s high-priority projects and the amount of money available for funding each one. Housing Element Update: The City is holding five neighborhood forums to get input on design guidelines and zoning code updates. Please participate! (Details are in this Coast News article.) All the documents can be found here. Thank you for your ongoing interest. Citizen scientists from Cardiff School explored the multi-step process of water treatment at the San Elijo Water Reclamation Facility in Cardiff. It’s a great joy to share the best of municipal government with our future leaders. Encinitas Mayor Catherine S. Blakespear shared a post. SANDAG leaders Hasan Ikhrata and Encinitas Mayor Catherine S. Blakespear were proud to be a part of the 14th Annual Binational Delegation to Mexico City. Local business and community leaders joined the San Diego Regional Chamber of Commerce to collaborate on issues surrounding trade, border security, the environment, and infrastructure. I’m really excited to be headed to Mexico City as part of a binational delegation, representing SANDAG and in collaboration with the Chamber of Commerce. The Cross Border Xpress airport is incredible. You walk into the human scale airport on the US side (1st photo) and cross the border inside the airport (2nd photo). Convenient, efficient and friction-free. Bienvenidos a Mexico! © 2014-19 Catherine S. Blakespear. All rights reserved. 1/20/19: Our Encinitas Finances are in Great Shape! 12/16/18: It’s Time to Make Our Encinitas Streets Safer!